Announcing the 2011 Joe Shuster Awards hosts: Ajay Fry and Teddy Wilson! As the Host of InnerSPACE, AJAY FRY is no stranger to SPACE or the airwaves. Born in Toronto, Ajay attributes his bizarre and creative sense of humour to growing up in Ottawa. His career in television began at an early age with roles on LASSIE, ARE YOU AFRAID OF THE DARK and BIG WOLF ON CAMPUS. He also regularly lent his young voice to cartoons such as ARTHUR, LITTLE LULU and CAILLOU. As a teenager, Ajay studied and performed improvisational comedy at Ottawa’s popular comedy club The iNSTiTUTiON under owner and Second City alumnus Ken Godmere. Shortly after turning 18, Ajay traveled to Beijing, China where he voiced a series of educational videos which were distributed across the country. In 2003 Ajay came to Toronto to study comedy and improv. He completed the conservatory program at The Second City and the Humber College Comedy program where he became a nominee for the prestigious Phil Hartman Award. After graduating, Ajay joined YTV as host of CRUNCH, their popular Saturday morning programming block. Ajay delighted YTV audiences for two years before joining SPACE in 2008 as host of the weekly genre entertainment show, THE CIRCUIT. In fall 2009, Ajay joined forces with Teddy Wilson to co-host the SPACE flagship genre entertainment show, INNERSPACE. Four nights a week, from Tuesday to Friday, Ajay and Teddy navigate the ever-changing world of genre entertainment commenting on SPACE’s signature primetime series, genre films, videogames and more. When not hosting INNERSPACE, Ajay is demolishing fellow gamers in online computer games like Left 4 Dead 2, StarCraft 2 and TeamFortress 2, designing websites or kicking around the local Toronto comedy scene. As on-air host for InnerSPACE, TEDDY WILSON goes above and beyond the call of duty to bring the world of genre to your space. Growing up in Ottawa, Teddy began his career in the entertainment industry as a child actor on the internationally syndicated series YOU CAN’T DO THAT ON TELEVISION. After earning an Honours B.A. in Political Science, the politically-active Wilson moved to Toronto to work at Queen’s Park. Political advisor by day, he started producing and promoting live comedy revues at various venues at night, including the prestigious Tim Sims Encouragement Fund Award at The Second City. After leaving politics Wilson worked his way up in TV production, eventually serving as talent booker on the Comedy Network series POPCULTURED WITH ELVIRA KURT. In 2005, Teddy joined MTV and helped launch flagship show MTV LIVE. While working as studio producer on the series his “former child star” status was often parodied during the popular “after-school special” spoofs. In 2008 Teddy left MTV to join SPACE as on-air reporter. Teddy’s first assignment for SPACE was interviewing George Lucas at Skywalker Ranch. Since then he’s been fortunate to interview a wildly eclectic range of other personalities, including: Jerry Bruckheimer, KISS’s Gene Simmons, George Clooney, director Terry Gilliam, Pixar’s Andrew Stanton and Pete Docter, Adrien Brody, shock-rockers GWAR, Jeff Bridges, comic artists/authors Bryan Lee O’Malley and Daniel Clowes and many others. 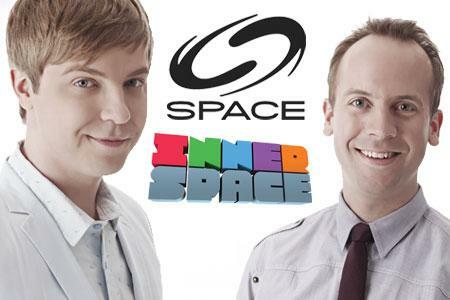 In fall 2009, Teddy joined forces with Ajay Fry to co-host the SPACE flagship genre entertainment show, INNERSPACE. Four nights a week, from Tuesday to Friday, Teddy and Ajay navigate the ever-changing world of genre entertainment commenting on SPACE’s signature primetime series, genre films, videogames and more. When not busy hosting INNERSPACE, Teddy plays drums in the indie-rock band HUDDLE, reads far too many comic-books and goes to a lot of movies. This entry was posted in General Announcements, General News by Kevin A. Boyd. Bookmark the permalink.